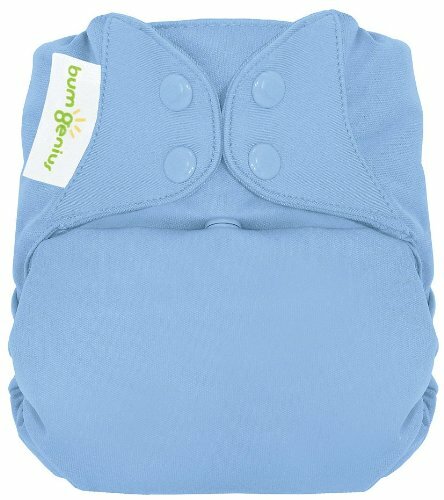 bumGenius Freetime All-In-One One-Size Cloth Diapers feature our patent pending butterfly closure system to provide a comfortable, trim fit. This simple design makes cloth diapering as easy as using disposables. Our no-stuff system with semi-attached, stay dry inserts is an ideal solution for families with a child in day-care or family members resistant to cloth diapers! Using the snaps on the front of the diaper, adjust the size if needed, put the diaper on your baby, wash, dry and re-use. No extra steps. No stuffing. No cover required. Our one-size diapers are designed to fit most babies weighing between 8 and 35 pounds. The soft, waterproof outer fabric keeps the diaper trim on your newborn and toddler. Soft, sueded inner fabric gently wicks moisture away from your babys skin. Super stretchy, gentle leg and back elastic with rolled out casings keeps the yuck in and help to keep red marks away.